When it comes to shoes, we love to go the extra mile—literally. From sneakers to boots, pointed-toe heels, and slide sandals, our footwear game is a big part of our outfits. That's why, while we love all our classic options, we can't resist a beaded, sparkly, showstopping twist. Embellished shoes provide the perfect amount of extra to elevate your next office-friendly look or your go-to LBD. Because not only are they the easiest way to completely transform an outfit, but they're guaranteed to be the most eye-catching as well. 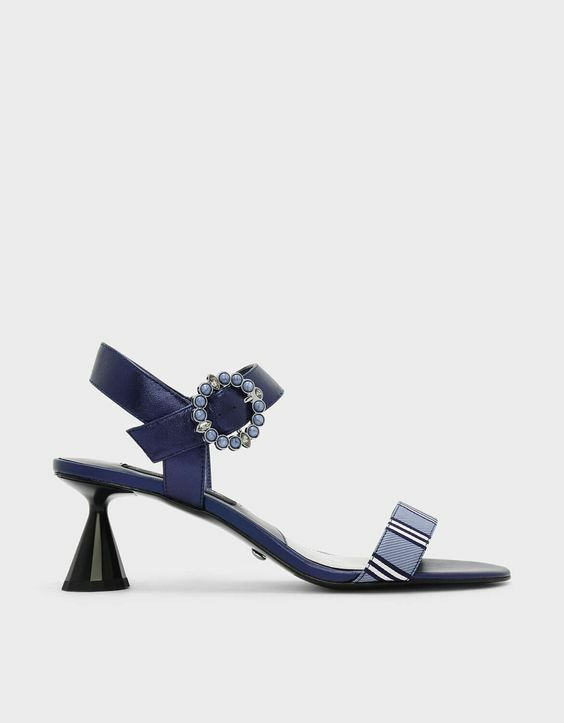 So if you like to keep your style pared-down but still want a bit of pizzazz, we're sharing the 15 best embellished, graphic shoes that will do just the trick. If you're looking for a statement pair of sandals. When sporty and extra meet, you get the best of both worlds. It's like a mini party on your feet. Strut your stuff in a pair of shoes with embellished heels. For when you want prints and studs on your sneakers. Velvet and sequins are always the right amounts of extra. Especially when together. The heart wants what it wants. We want these sandals. Update your next office look with these block kitten heels. These were made for street style. Give practical platforms an extra twist. Nothing says extra more than Swarovski-embellished sandals. These pearl-accented mules also come in a classic black color. Cowboy boots, but make it fashion.